If you are seeking a wide range of commercial locksmith products from the best manufacturers, look no further than Colgate’s Locksmith. All of our products are at attractive prices and with special discounts for businesses. Time is money when it comes to business. That’s why we’re available around the clock. You can count on us to deliver quality products and unprecedented service 24 hours a day, seven days a week! Safeguard your valuables with our full array of safes. Protect your vehicles using our on-site automotive key replacement and computer chip and electronic key duplication services. Provide hassle free re-key service in your time of need. Whether it’s a disgruntled employee, a lost key situation, lockout services, or you just want peace of mind, we are here to provide the solution quickly and easily. 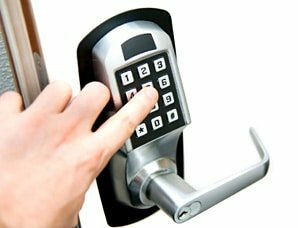 What Makes Our Commercial Locksmith Services Different? Our clients are involved in the product selection process in order to ensure the correct choice for their business at affordable prices. The nature of our work with the business sector is principally based on long-term working relationships backed by personal and reliable service. As your local business grows, we’ll be there with you every step of the way – that’s our commitment to your business and most importantly, to you. We served many businesses throughout Louisville, as well as New Albany, Charlestown, Clarksville, Jeffersonville and Sellersburg, Indiana.